Smurfs are cute little blue creatures with white floppy hats who live in mushroom-houses in a magical forest. They are cared for by Papa Smurf, the Gandhi of cartoon characters - so caring and lovely that he even turned around the character of Smurfette - the girl smurf sent by evil wizard Gargamel to tempt them. The Smurfs are so without guile that they defy post-modern teenage cynicism regarding their sexual proclivities and political leanings. 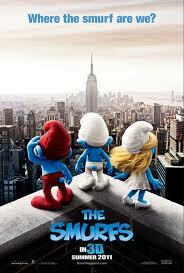 Okay, there may be a hundred boy smurfs and just one smurfette, but what's so odd about that?! What I like about this new live-action/animation movie is that it both embraces the innate loveliness of smurfs, while also tipping its hat to the anachronism of Peyo's creation. What you get is a movie that is basically very simple and sweet, but also contains the odd witty wink to the camera - such as mocking the use of the word "smurf" as an all-purpose asterisked curse-word; or having Papa Smurf decode a magic spell by looking at an old book of Smurf "mythology" aka a Peyo comic book! The contrast of Smurf naivete and modern-day cynicism is achieved, as in the movie ENCHANTED, by having the wizard Gargamel chase the smurfs through a "vortex" to contemporary Manhattan, where they are stranded until they can magic a blue moon and get back home. Just as Amy Adams' Giselle made Patrick Dempsey's Robert a softer, more fun-loving person in ENCHANTED, the Smurfs give Patrick and Grace Winslow (Neil Patrick Harris and Jayma Mays) a new-found joyfulness and confidence. I liked the parallel between Patrick discovering the confidence to be a new father with poor Clumsy discovering that he doesn't have to be defined by his name, as all smurfs typically are. So, as you can tell, I just about enjoyed THE SMURFS because, well, smurfs are cute, and made me feel nostalgic. But, objectively, this is a very badly made movie. Director Roger Gosnell (BEVERLY HILLS CHIHUAHUA) and DP Phil Meheux (THE MASK OF ZORRO) shoot everything in a workman-like over-lit obvious style; Hank Azaria is mis-cast and hammy as Gargamel (imagine Jim Carrey in the role - so much better); the plot is predictable; and for a kids film without sustained adult in-jokes, the run-time, at 100 minutes, is too long. For all those reasons, this isn't the kind of children's film that adults can watch without the excuse of taking the kids. But as genuinely earnest, warm-hearted entertainment for the young cinema viewer, it will, no doubt, hit the spot. THE SMURFS is on release in the US, Canada, Argentina, Spain, Belgium, France, Germany, Hong Kong, Israel, Malaysia, the Netherlands, Peru, Brazil, Colombia, Costa Rica, Mexico and Turkey. It opens next Friday in the UK, China, Iceland, Ireland, Portugal, Russia, Serbia and Paraguay. It opens on August 19th in Estonia, Lithuania and Poland and on August 25th in Denmark and Hungary. THE SMURFS opens on September 2nd in Singapore, Finland, Norway and Sweden; on September 8th in Greece and Japan; on September 16th in Italy and on October 6th in Thailand.